The preceding chapters have explored the concept of sharing small amounts of data between a WatchKit app and the containing iOS app using the NSUserDefaults class and app group sharing. Clearly, this approach could also be used for sharing user preferences between the iOS app and the WatchKit app. The containing iOS app might, for example, provide a screen within which the user is able to configure the text color and font size used to display text within the corresponding WatchKit app. A more consistent approach to providing preference settings for a WatchKit app, however, is to make those settings available via the Apple Watch app on the iPhone using a WatchKit settings bundle. 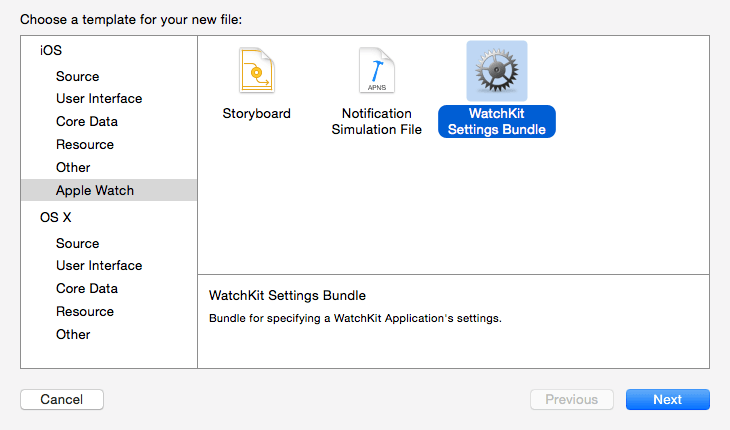 This chapter will provide an overview of the WatchKit settings bundle while the next chapter, entitled A WatchKit Settings Bundle Tutorial, will work through the creation of a settings bundle example project. iOS running on the iPhone now includes the Apple Watch app (Figure 16-1). In addition to configuring the pairing of the iPhone with an Apple Watch device, the app also provides access to preference settings tailored for each installed WatchKit app. Additional preference settings can be made available from within the Apple Watch app through the use of a WatchKit Settings Bundle. The WatchKit settings bundle defines which settings controls are to be displayed on the preferences page and stores the results using the NSUserDefaults class. Access to the chosen preferences from within both the iOS and WatchKit apps is achieved through the use of a shared app group as outlined in the Sharing Data Between a WatchKit App and the Containing iOS App chapter of this book. On the subsequent screen, make sure that the iOS app target is selected in the Targets section of the “Save As” panel as shown in Figure 16 4. The filename will be specified as Settings-Watch by default and should not be changed. Toggle Switch – An On/Off switch mechanism allowing the user to select one of two values for a preference. Slider – Allows the user to make a preference selection within a range of values. Text Field – An editable text field into which information can be typed by the user. Multi-value – Provides a mechanism for the user to make a selection from multiple options. When selected, a second screen is displayed listing the options from which a selection can be made. 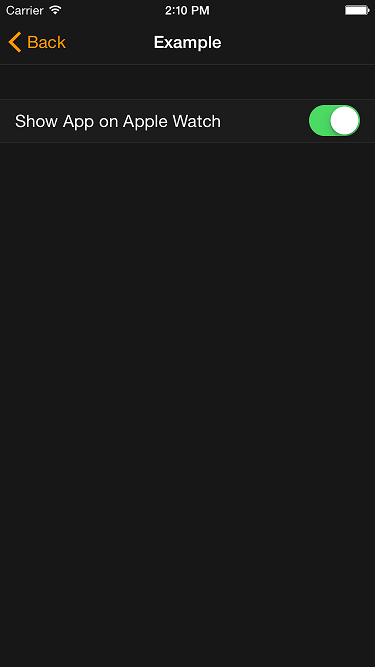 Title – Displays read-only text to the user. Group – Used to group preferences together under a specified heading. Child Pane – Allows the user to navigate to additional pages of preference settings. The controls are added to the Root.plist file and configured using the Xcode Property List Editor. When a control is added to the property list file it needs to be assigned an identifier key. This is the key that will be used to extract and set the current preference value from within the code of the iOS app and WatchKit extension. Figure 16-6 shows an example Root.plist file loaded into the Xcode Property List Editor. In this case, the list consists of a single preference control item in the form of a toggle switch. The toggle is configured to display a title which reads “Use Large Font” and to be enabled by default. The item has also been assigned font_preference as the identifier. Obviously preference settings are of little use if the WatchKit app does not identify the current settings and act upon them. The WatchKit bundle settings reside within the containing iOS app but will need to be accessed from the WatchKit app extension. This sharing can be achieved by creating an app group and configuring both the containing iOS app and WatchKit extension to be group members as outlined in the chapter entitled Sharing Data Between a WatchKit App and the Containing iOS App. Each item added to the Root.plist file through the Property List Editor has associated with it an optional default value. In Figure 16 8, for example, the toggle switch was configured to have a default Boolean value of YES (or true). A common mistake made when working with user defaults is to assume that the defaults set in the properties list file are the values that will be stored in the settings bundle in the absence of the selection being made by the user. In reality, these settings only define the appearance of the control when it appears in the preferences screen for a WatchKit app. In fact, a preference value is only saved to the settings bundle when the user makes a change to that value using the control in the preference screen. It is important, therefore, to write code to configure user default settings within the settings bundle so that a sensible default value is returned in the event that the user has yet to change the setting. This operation should be performed each time the app launches and is achieved using the registerDefaults method of the settings bundle NSUserDefaults object. This method takes as a parameter a dictionary object containing the keys for which defaults are to be set and the corresponding default values. Code such as that shown above ensures that default values will be returned when accessing the corresponding keys from within code. Since the registerDefaults method does not overwrite any settings already saved into the settings bundle as a result of user preference selections, it can be called safely each time the app is run. When the Apple Watch app on the iPhone lists the WatchKit apps for which settings are available it will display both the app name and an app icon within this list. 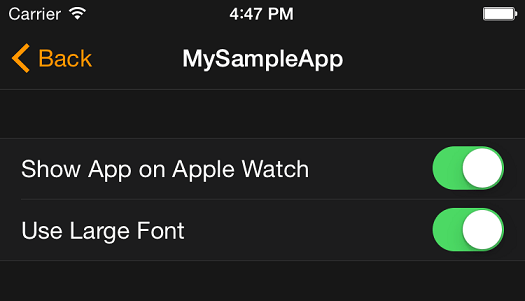 Until a Companion Settings icon is added to the image assets catalog of the WatchKit app, the default icon will be displayed. The icons for the Apple Watch app need to be placed in the Apple Watch Companion Settings category. Icon images should be provided for both the 2x and 3x image scales. Since 1x image size is specified as being 29x29 pixels (29pt), the 2x and 3x icons need to be 58x58 pixels and 87x87 pixels respectively. Once the icons have been created, simply drag and drop them onto the icon placeholders in the asset catalog. With the introduction of iOS 8.2, the Apple Watch app is now installed by default on all iPhone devices. Among the features provided by this app is the ability to modify the preference settings for any WatchKit app installed on the watch device. By default the settings provide control only over whether or not a specific WatchKit app is visible on the paired Apple Watch. Through the use of the WatchKit settings bundle, however, the Apple Watch app can be used to provide the user with a central and consistent location through which to change any number of preference settings for a WatchKit app. A range of different settings controls can be defined within the settings bundle property list file including text fields, sliders, switches and multiple value lists. Through the declaration of settings identifiers and app groups, the preferences stored within a WatchKit settings bundle can be accessed in code from both the containing iOS app and the WatchKit extension.